In 1872 Wyoming, a former gunslinger and his estranged father encounter a ruthless businessman and his posse of thugs. 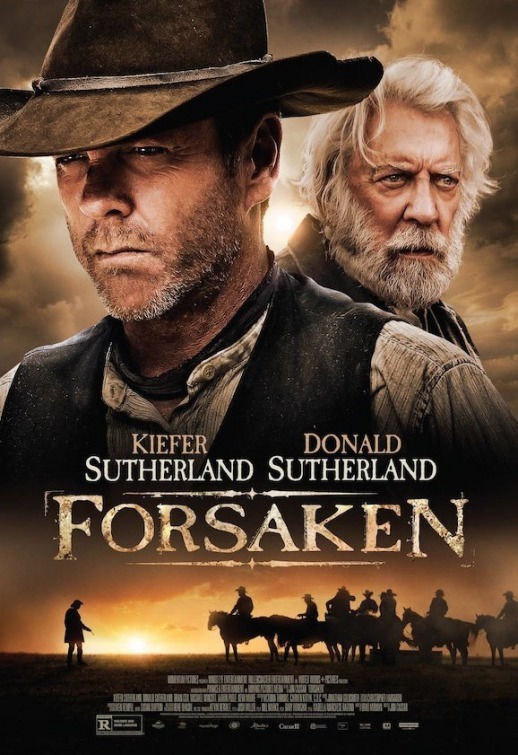 Director Jon Cassar’s Forsaken is very much a paint by numbers Western, however, the draw (no pun indented) is having father and son Donald and Kiefer Sutherland share the screen. In addition, the supporting cast elevate Brad Mirman’s screenplay with the likes of Demi Moore, Brian Cox and Michael Wincott. Wincott’s Dave Turner, a dangerous principled gun for hire is particularly notable aiming for the heights of Tombstone’s (1993) Kilmer Doc Holiday and underrated Aaron Poole shines as thug Frank Tillman, both actors leave an impression. Along with Jonathan Goldsmith’s score Cassar’s low-key Western captures the essence of the classics including Shane (1953). And while it’s not a novel as the recent Bone Tomahawk (2015) or as broodingly fun as In a Valley of Violence (2016) it ticks all the American West boxes. Kiefer Sutherland’s John Henry Clayton like Ethan Hawke in the aforementioned film is haunted by the war, Here writer Mirman doesn’t really offer anything new, however, thanks to Kiefer’s simmering cowboy performance he sells the heartache and torment of a repressed killer. The love triangle between Moore’s Mary, her husband and John adds some drama in amongst Cassar’s well staged fights and shoots out as people are force to sell of their land. Donald Sutherland’s Reverend William Clayton only gets one scene with Cox (who sadly isn’t given much to do) an unscrupulous business man James McCurdy. But the Sutherland’s father and son relationship tensions offer some weighty telling scenes with tragic accidents, war, mother and brother back-story dynamics which hold interest. The preceding peak in the showdown closing act and Winacott and Kiefer cement their gun slinging positions in a satisfying close. Overall, it doesn’t shake the genre up but is worth watching if only for the Sutherlands, Winacott and Poole’s performance.